Building Customer Experience (CX) design capability at SA Water – Let's design a better future, together. SA Water had been South Australia’s monopoly water and waste water manager for over 160 years. It was a traditional organisation that mainly delivered service through a phone-based contact centre where the onus was placed on the customer to get in touch when something went wrong. While significant investment had been made in community engagement around infrastructure projects, ICT projects were still internally focussed and often delivered without input from end users. In 2014, I was tasked with developing SA Water’s first digital transformation strategy – I knew that for it to be a success the organisation had to fundamentally change the way it delivered technology projects so that customers had a voice in the process. This needed to be done quickly as there were a number of significant digital projects already in train. Working with the Project Management Office (PMO) to review the existing suite of project management processes and tools then rewriting them to include user-centered design processes. Developing a range of templates that people could use and adapt for their own projects including design principles, research guides, test scripts and needs-based personas. Making design visible – we moved our project teams to where our customer service people worked, opened our doors and kept them updated on what we were working on. 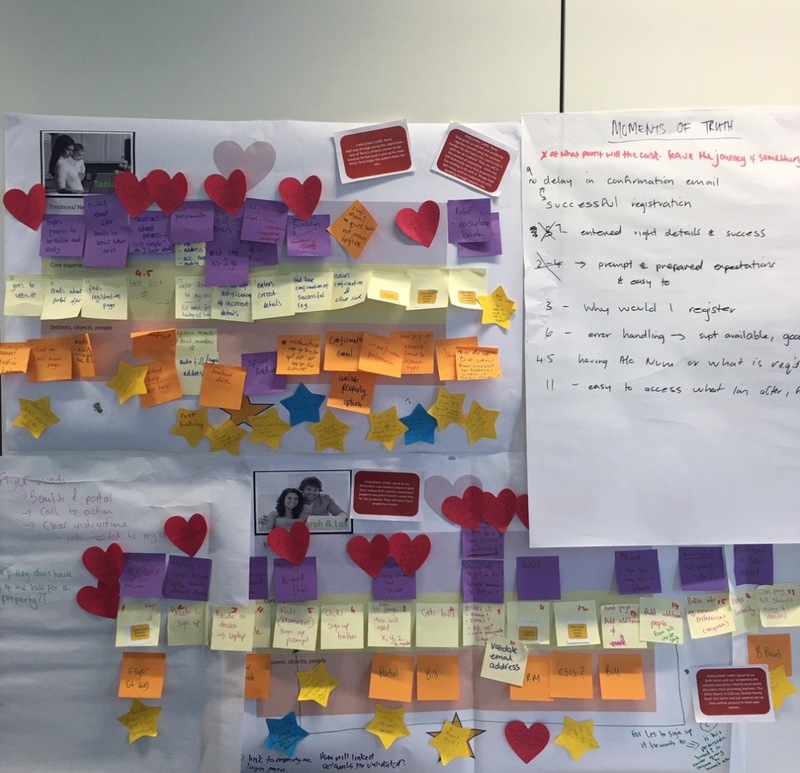 Building capability – I coached a number of people across the business to lead design activities including user testing, journey mapping and persona development. I worked with a large number of senior stakeholders across the business to achieve this as a joint initiative including our technology teams, PMO, customer service, billing and operations teams. The Customer Experience strategy I co-authored was extremely well received by SA Water’s Senior Management Group and galvanised the business around the simple vision “to deliver a great customer experience’. User centered principles became a key, embedded part of digital project delivery – no digital service project is completed at SA Water now without customer input. By the time I left SA Water in 2016, it was often cited as one of the leading examples within the South Australian government in terms of its commitment to customer-led design and became one of the first agencies with a dedicated Customer Experience team soon after I left. In designing both the new Customer Experience Strategy and Service Design framework I saw how critical it was to present staff across the business with steps that were easy to understand and follow. Visual design played an important part of this as did the language we used to communicate what needed to change. 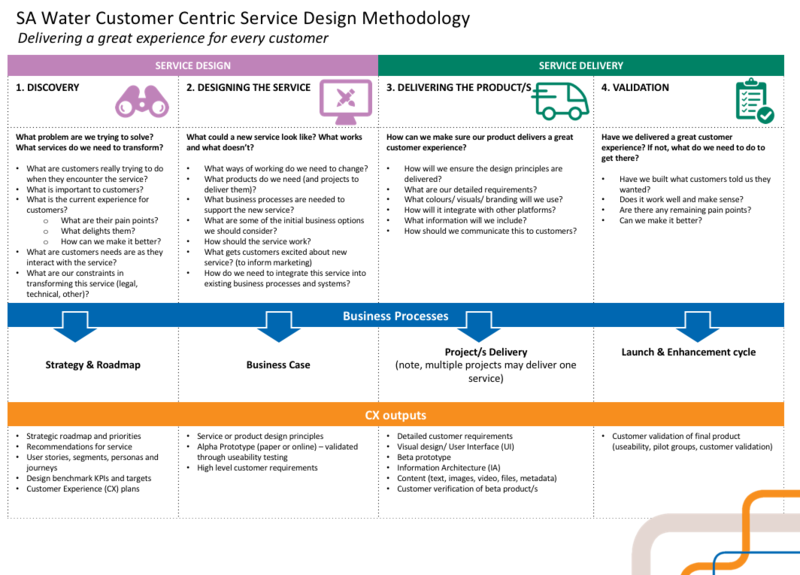 Both the CX Strategy and Service Design Methodology were complex communication pieces but I made sure both could be communicated on a single page. 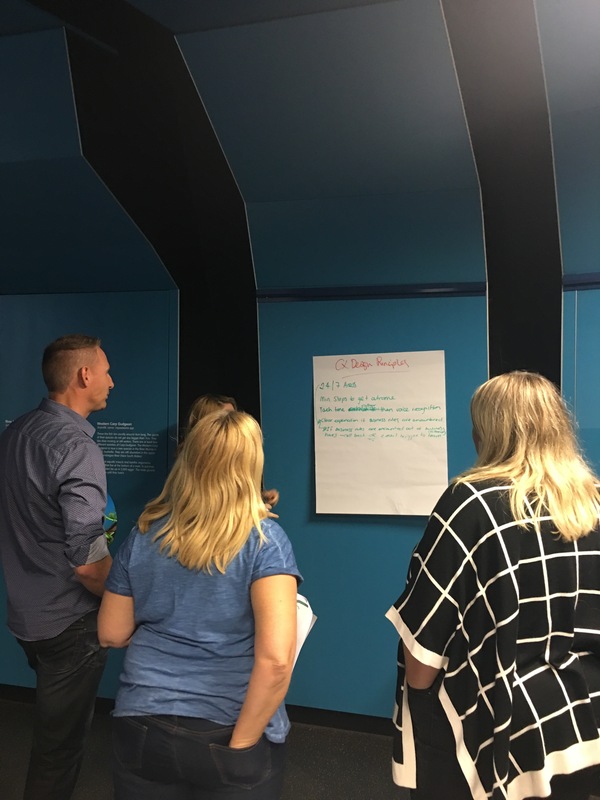 This was supported by opportunities to learn by doing – cross-functional teams from the business worked with directly with customers and were able to see the benefits first hand. This enabled me to build advocates across the business really quickly.